Vibe on the street: busy, touristy, authentically Roman. Famous for: beautiful squares such as Piazza Navona and Campo deFiori, the Pantheon and lots of other monuments. Not to mention great nightlife and a varied range of shops. Rome doesnt get any better than the Centro, the historic centre, where there is an amazing fountain, palace, piazza or monument at every step. Since the early Renaissance, the centre (or centro storico) has been the preferred choice of shopkeepers, artists, families and heads of state for its beauty and great location. Think of the Centro as a walking photo opportunity, hub of Italys political scene, playing ground for school kids and busy commercial centre, and prepare to fight for your tiny space on the pavement. 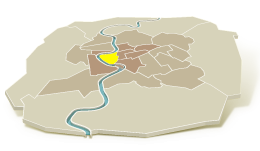 Fitting into the western curve of the Tiber River, the Centro neighbourhood is triangle-shaped with Via della Scrofa/Via Arenula at its eastern border. Piazza Navona and the Tiber River (from Lungotevere Tor di Nona to Vallati) will be your best points of reference as everything is either just behind Piazza Navona or close to the river. Neighbouring areas include Campo Marzio and its monumental tomb to Augustus Caesar, Colonna, which is famous for shopping around Piazza di Spagna and the Historic Area, dominated by the traces of Ancient Rome including the Roman Forum and Coliseum. Theres also Esquiline, where Termini Station is located. It may be a bit tough to get to know the neighbours in the Centro neighbourhood. Youll find it so busy with day-tripping shopkeepers and tourists that you may not notice the nonni e nipotini, in other words the grandparents and families who stroll around the area. The English language is probably almost as common as Italian in the Centro and you will see that most signs have inspiring English translations. Renting an apartment in the centre may be the closest you come to hanging out with real Romans. Though ground floors of most historical buildings have been converted into shops of all kinds, Romans still live in their apartments so dont hesitate to test out a buon giorno or grazie when taking out the rubbish. The Centro area has every kind of shop you could desire, whether home goods or high end, souvenirs or supermarkets. All you have to do is step out the door and ask. Most Romans will tell you to head to Via dei Coronari if youre looking for antiques or unique pieces. A nice shopping complement to Coronari and its alleys are the quiet via Giulia and Via Montserrato/Via Banchi Vecchi, with a mix of boutiques and beautiful palazzi. If youre on the hunt for shoes, casual wear and action, Via dei Giubbonari and the streets radiating out from Campo de Fiori are the places to strut. Youre in the centre, so its as easy as putting one foot in front of the other. Narrow and labyrinthine, these streets are made for walking. Vatican City and Trastevere are just across the river and Piazza di Spagna (Colonna) immediately to your east. However, if you must not break the proverbial sweat, the neighbourhood is connected all over Rome by buses (not metro). Buses 40, 62, 64, 81, 116, 119, 280 crisscross the area and will link you with Vatican, Termini, San Giovanni in Laterano, Via Veneto, Villa Borghese, Piazza del Popolo and even the Olympic Stadium. As we said, the Centro has everything. Contemporary art galleries are dotted around between monuments, cafés overlook overly Baroque piazzas and palazzi, and nightclubs hide in the side streets. Most morning coffee bars become afternoon hangouts serving aperitifs and, by evening, watering holes. If Rome is one big party, the Centro is the guest of honour. No matter what, you must walk into the Pantheon, a former temple and now church from the 2nd century. We dont want to spoil the surprise but remember to look up at the centre of the dome. Piazza Navona is perhaps the prettiest square in the neighbourhood, with its Bernini fountain and Borromini-designed church. Campo de Fiori is a lively outdoor produce market from the early hours through midday. And though technically the conduit between Centro and the Vatican, Ponte SantAngelo (also known as the Angel Bridge) is a beautiful pedestrian bridge crossing the Tiber. The Centro is known for having some of the prettiest coffee table views as well as some of Romes best coffee. Park yourself in front of Piazza Farnese at Caffe Farnese, but remember the price for beauty can be high. Caffe SantEustachio boasts the best espresso and cappuccino in the Eternal City, so its worth braving the queue for a shot of black gold at the bar. Looking for a good meal? Its true that the Centro is overridden with restaurants whose goals may be less culinary than financial, but there are still a few good, nay, great spots in the Centro for all depths of pockets. Restaurants Ar Galletto, Santa Lucia and Roscioli, and pizzerias Montecarlo and La Focaccia are just a few of the best. Keep an eye on ParlaFood and Elizabeth Minchilli for current listings and in-depth assessments of the Centros food scene. Its easy to find evening action in the Centro. Just head to any piazza and youre bound to come across a bar serving aperitifs. Bar della Pace and Bar del Fico are Piazza Navonas reigning king and queen, while any bar at Campo de Fiori after 5pm is a great spot for a late afternoon drink. Later in the evening, these bars overflow as night-time hangouts for the post-dinner drinking scene. Etablì, again near Piazza Navona, is where the young and fabulous grab an after-dinner cocktail, and around the corner is La Maison for some late night dancing. It doesnt matter where in the Centro you are, a waterhole or hangout is always around the corner. For those staying in this area, keep in mind that the neighbourhood doesnt go to sleep until the wee hours of the morning.